The govDelivery platform allows administrators to create and manage numerous topics that allow their audience to opt to receive different alerts – whether that’s newsletter, press releases, bill reminders, or parks and trails updates. Topics like these are geared toward the public, and because of that, they are considered “listed” in govDelivery. But did you know that admins can make topics “unlisted” or “restricted” as well? What makes these different from listed topics? Unlisted topics: These are visible to an administrator who can send a subscription link to other people. Restricted topic: Only the administrator can see these. There is no public link associated with them. You might be wondering: What’s the purpose of having unlisted or restricted topics? After all, don’t you want people to sign up to receive alerts? But don’t worry, there are a couple different reasons why you might not have a listed topic. The one this post focuses on is internal updates or alerts to staff. govDelivery isn’t just for sending message out to the public – it can be a great way for government organizations to manage their internal comms. For instance, a restricted topic is a way to store your staff list, especially if your organization uses a COOP (Continuity of Operations Plan) that includes the ability to notify internal stakeholders in case of an emergency, such as a natural disaster or system failure. Of course, if you’re using a topic in this way, you need to make sure it’s up to date. How does an administrator of a large organization ensure they have everyone on the org chart included? That person could manually upload the staff list via a CSV file. But this process can quickly become cumbersome, lead to errors, and takes up valuable time. Instead, an administrator can automate the process with govDelivery’s Application Programming Interface (API). Our platform has a set of APIs that already support numerous entities in automating subscriptions, manage topics, and sending alerts. Want to know more about APIs? Check out our post on it here. Steps 1 and 2 are the inputs in the Active Directory, while 3 and 4 are getting emails address from AD and transforming the data into an accepted format for govDelivery. 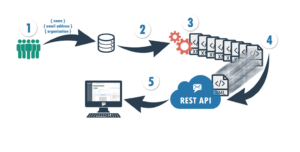 Step 5 is the actual request using our Subscriptions API to move email address into govDelivery. Sound confusing? Don’t worry, we can help. Are you interested in setting up internal alerts and comms at your organization. Get in touch with us today, and we’ll show you how.